The big commotion in south OB on Sunday was caused by a guy who tried to go surfing in his car – a Kia. 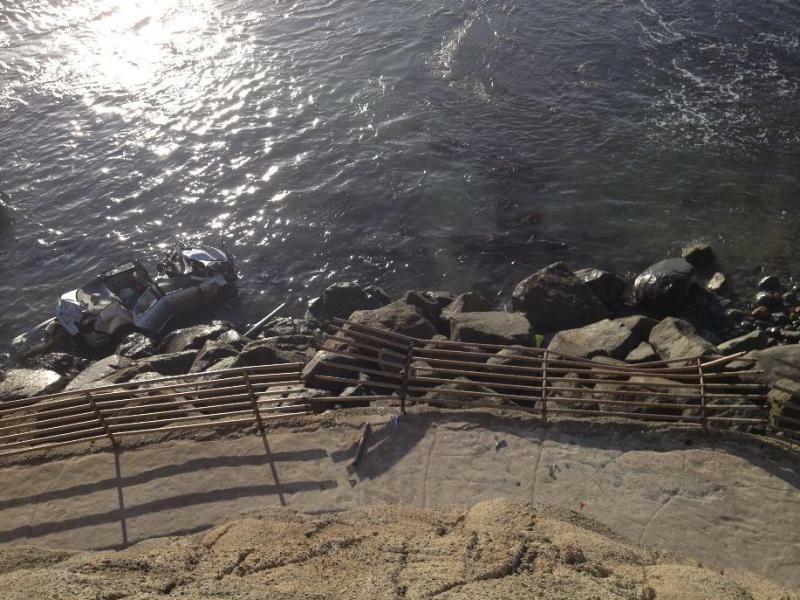 Actually, it appears that an unidentified male drove his car down that steep concrete path at the end of Orchard Avenue near Cable Street and through a guardrail into the Pacific. This was about 3:20 pm on Sunday, March 16. 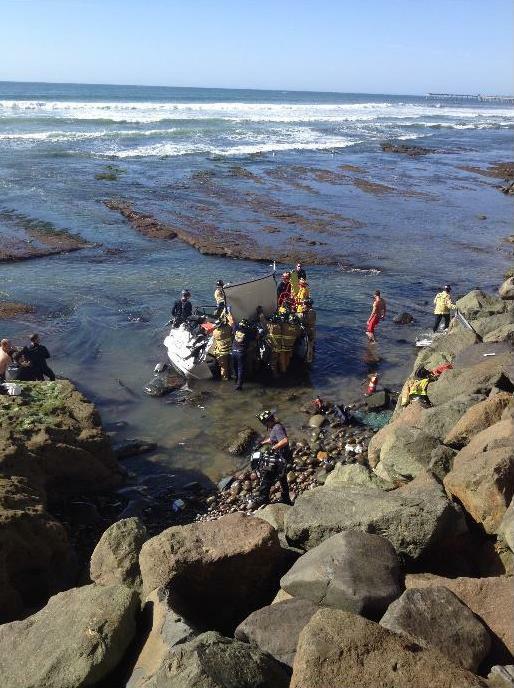 Surfers tried to get the guy out of his car as he was trapped initially. Finally, a helicopter from the San Diego Fire-Rescue Department showed up, and performed the rescue, flying the driver to a local hospital, a fire dispatcher said. Neither his condition nor the cause of the crash are known at this time. Fortunately for us, Daniel Shay was there and took these amazing photos. Meanwhile, ironically also on Sunday over at the OB Pier, NBC7 reports that lifeguards were getting some practice. Pros were demonstrating the proper techniques to lifeguard candidates in simulated rescues as part of the 49th Regional Lifeguard Academy-Rescue Demonstration. 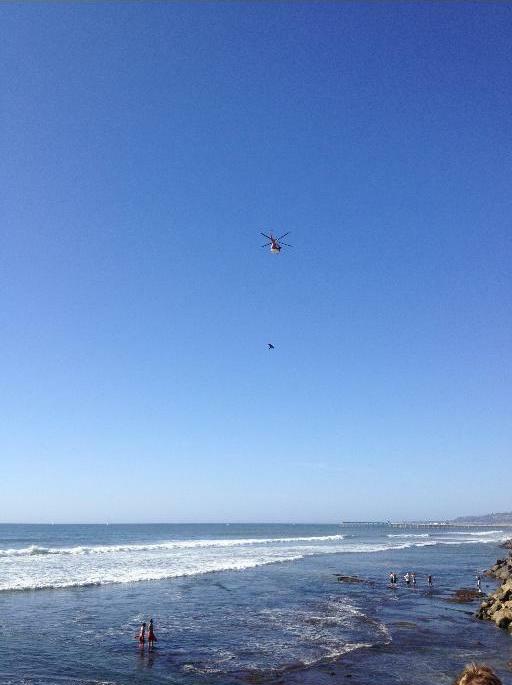 First, things kicked off with a rescuer jumping from a San Diego Fire-Rescue helicopter to access a “victim” in the water. Next, lifeguards had to use a boat to save a victim. Officials practiced a fire boat response, showing what would happen if rescuers had to save people from a vessel in distress. And to top things off, the lifeguard recruits took a dive off the Ocean Beach Pier. No, it wasn’t just for fun. The recruits may face a time when a pier may be the fastest way to reach a distressed swimmer. The demonstrations were organized by the Miramar College San Diego Regional Lifeguard Academy. Through that program, students can get college credit along with training to become an entry-level bay and ocean lifeguard. The academy said many lifeguard agencies hire from the pool of people who graduate from the courses. This upcoming summer, the academy expects San Diego County agencies to hire more than 100 lifeguards. Title your article is slightly grotesque from what I understand mental illness was because of this accident. Seems sort of funny from a periodical that prides itself on compassion. Ted, we looked at over half a dozen news sources and there was not one word or indication of any mental illness. We are a compassionate website but we also make fun – at times – at stupid things people do. Apparently, LEO’s on the scene told several bystanders that this was a suicide attempt and ye olde game of telephony soon ensued around Pescadero, Cable, etc et al. Such (potential, alleged) hearsay is not concrete enough to run on, and nothing that local media outlets would report even if it was, but … for what it’s worth. I concur with Ted. Numerous reports (now) state that this was probably a suicide attempt. Wait a minute…am I to understand that dude caught mental illness from a car crash??? He must have really bumped his head. Good work Daniel Shay, those are some top notch photos. Did anyone else see a Nissan Sentrain the water? Thank you. It was surreal seeing the car down there, watching them use the jaws of life to cut off the roof and feeling the life flight helicopter approach. The movies do not do justice concerning the force of the wind generated by the blades. It was a somber moment and very serious and sad. Later, the tide came in, the sun set and the car lay in the surf. The power of the ocean continued to bash it on the rocks like it was nothing. Hard to have much sympathy for someone who disregards us so blatantly. Lucky no one else was injured as he sped through the neighborhood and then crashing down on the sidewalk below Cable. I thinks it bs to put others in harms way or even worse take others with you during a suicide. Not sure I understand the line of reasoning there. But I guess thats the obvious point, these folks are not sane. I thought the headline was in poor taste as well. It doesn’t really matter whether the person went over the cliff out of stupidity, drunkenness, mental illness or a desire to hurt himself. It’s a pretty serious event (as evidenced by the air lift rescue) regardless and deserves to be treated as such. Sorry if you and others were offended. We on occasion will make fun of people who go over the cliffs in seemingly unthinking moves that help injure themselves, help destroy the beautiful Sunset Cliffs, and help drive up costs of first responders and other emergency facilities and personnel. I’ve seen too many of these incidents over the years – and yes a few are tragic – but many are made by folks who don’t respect the cliffs, the beaches below, other humans in their way, and ultimately don’t respect themselves. Excuse me if we make fun of some guy for whatever reason who drove down that concrete path and over the side. It was stupid and he could have seriously hurt others. Im sure you would not be as concerned for this mans well being if he intentionally ran off, say the Santa Cruz. 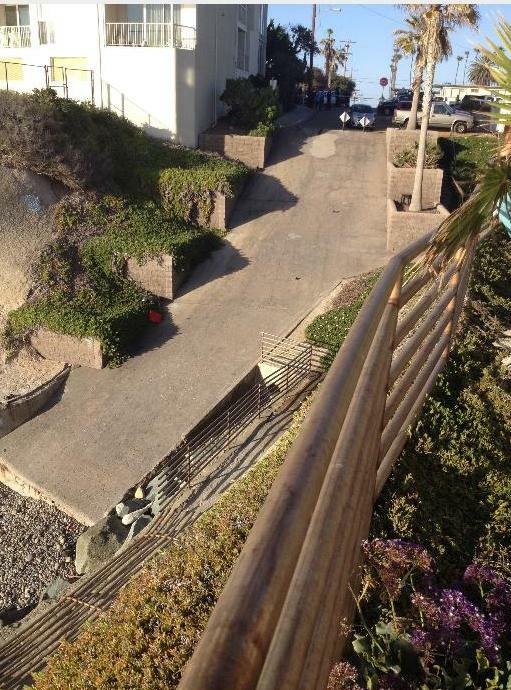 Ave. cliff, onto our children and our neighbors who were enjoying the beach below. I don’t know for sure what happened but if this guy was doing 80mph and blowing stop signs (as reported) to suicide off the cliff at a public beach….I have zero sympathy for him. Heck of a lot easier and no risk to me and you if he just put his mouth round the tailpipe in the driveway. Suicide with the intent to hurt others is no ok in my book. If he is sane I hope he gets plenty of jail time to think about it! Thanks for your response, Frank. I wasn’t offended. I just found the headline a little jarring after I read the content especially in light of what the videographer, Daniel, described as a somber moment and, as you said, an event that could have killed someone. It wouldn’t occur to me to think that someone might go over a cliff just out of acting stupidly or disrespect to the community. When I think of people disrepecting the cliffs, I think of all the empty beer bottles and other trash I routinely see there. But that reminds me that I saw a sign in a store window on Newport over the weekend. It said: “Respect OB. If you see anyone disrespecting OB, call 619 – – – .” I was distracted and didn’t look at it for very long, but was wondering who is on the other end of the line and what they are doing with the reports they receive. I cannot speak on the specific sign you saw but my guess is that it’s related to the other ‘Respect OB’ signs posted around town. If I’m correct, then number listed would be 619.531.2000, it is SDPD’s non-emergency line. Everyone in OB should have this number saved in their phone and utilize it to report (remember to get the incident # from dispatch before ending the call) any incident/activity that may not be serious enough for 911. For example: a disruptive neighbor, drinking on the beach, drug use, graffiti etc…I have personally used it several times and found that it is an effective tool. I hope that helps! The OB Rag is full of empathy, daily – have you not noticed? We also will point out stupidity when it crosses our noses. 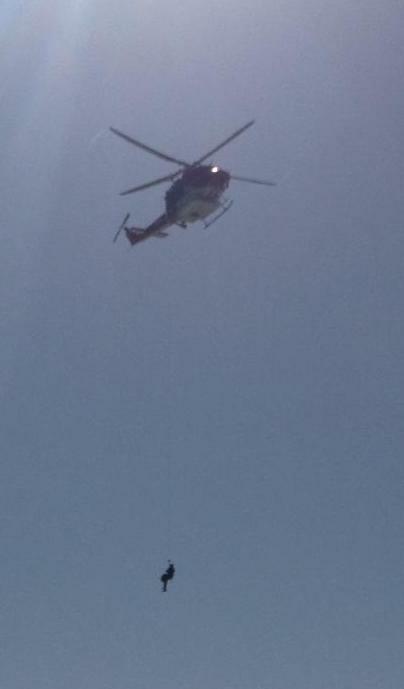 I have empathy for the rescue worker hanging from a cable underneath a flying helicopter. I have empathy for the lifeguards who had to put their own lives on the line to save this man from himself. I have empathy for my neighbors who had to witness this terrible scene and explain it to their children. I have empathy for my fellow citizens who’s tax dollars paid for this jack asses rescue. That said, I would have been heartbroken if he had killed a innocent child during his selfish act. Now if it comes to light the accelerator was stuck wide open and this guy drove like Andretti to find the safest place to ditch the out of control vehicle…he has my total respect and empathy! I have empathy for anyone who finds themselves in the frame of mind where driving off a cliff seems like a viable option. As a USCG veteran I also have empathy for the rescue worker, as a mom I have empathy for the families who were subject to that horror. Yes, I was there, too. I find “humorous” coverage of sad things to be a very subtle form of bullying. I also dislike Americas Funniest Home Videos for the same reason. And I believe in unicorns and peace on earth. I too have empathy for someone in that state of desperation. It just gets real frustrating when they try to involve/risk others. It a bad deal all around. Thanks for your service in the USCG, Sarah. I’ll keep a eye out for those unicorns!